Reading local fish reports you would think anglers were catching trout every cast on Northern New Mexico’s Lower Red River. New Mexico Game & Fish’s weekly report stated action was very good. 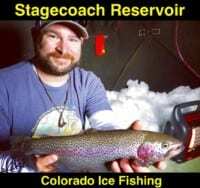 We reacted by flying to Albuquerque and driving north to the Lower Red to cash in on the action, but didn’t find exceptional action, rather tough fishing. The Lower Red River is one of the more popular fisheries in the region and is stocked frequently. And, don’t get me wrong, we caught and released a limit of trout here daily for several days as we filmed Pautzke Outdoors. On the other hand, we had to work hard to catch them. We filmed segments two evenings and one morning and talked to dozens of anglers, most of which were frustrated by the tough fishing. Conditions are good on the Lower Red. Flows have subsided to fall levels, the water temperature is favorable and clarity is good (after a slide muddied it up a few weeks ago), but the total number of trout in the section from the Red River Hatchery on downriver for a quarter-mile wasn’t great. To be honest, I’d guess that 90 percent of the anglers we spoke with (including the fly guys) caught one or fewer fish. We were fortunate to catch as many as we did. As NM G&F continues to stock trout fishing should improve, but the system continues to get hit hard (as it always does when flows are favorable). On a positive note there are still some big trout in the system. We hooked (and lost) one rainbow over five pounds and another about three, but most where standard nine to 10-inch bows. We also caught a bunch of smaller browns and one brown about 12 inches, but had to work much harder than we expected. If it weren’t for the pool below the footbridge the struggle would have been greater. The pool produced a few limits for us. All our action came on two baits: Peach Garlic Fire Bait and the new Fire Balls. We used Chartreuse Garlic, Red, Red with Glitter and Pink Shrimp Fire Balls and caught trout on all of them. The key was having multiple options and switching colors often. Using light line was also vital. We employed four-pound test on small size 10 to 12 salmon egg hooks. I’d recommend using only one Fire Ball at a time. Considering they stay on the hook better than real salmon eggs you won’t have a problem with it falling off the hook. As clear as the water is two eggs might bring too large of a profile. Where to fish on the Lower Red is no secret. From the bridge leading into the hatchery on downriver for a quarter-mile brings the best action for fresh stockers. The bite will improve with the next trout stocking. Keep in mind roughly two weeks ago the state stocked about 200 15-plus inch rainbows. Some remain in the system, but many were caught, too. They should be considered a bonus catch rather than expected. Editor’s Note: Pautzke Fire Bait and new Fire Balls (in Red and Red with Glitter) are available at all New Mexico Walmart locations. All 11 colors of Fire Balls are available online at FishUSA.com.